As if that wasn’t enough for one weekend, I also had a second date with PS. 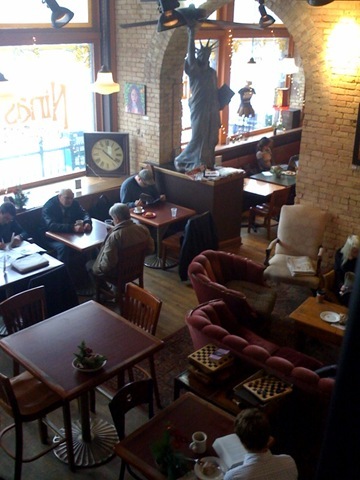 Last week, we met at Eli’s and had a nice time chatting at the front table by the window. On Sunday, he called to ask me out again. Rather than the usual back-and-forth that can be so characteristic of these situations, this guy simply said, “Hey, I made a reservation for us at W.A. Frost at 7.” Now that, I love. No asking. No dalliance. Just good, old-fashioned datemaking. I graciously accepted. But Frost? Truth be told, I was hesitant to go to there on a second date, given that it is fabled to be the epitome of romance. But when the dating gets tough, I suppose the tough get dating. I flipped up my hair, put on the new sweater and my snow boots, and crunched my way there in the snow. I know that W.A. 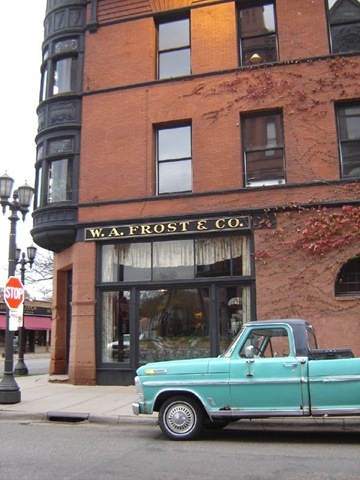 Frost has won many awards for its food. I know it used to be one of those creepy old pharmacies. I know Fitzgerald probably stopped by for an ice cream and a bottle of Coke, and that perhaps Nina herself used the corner of Western and Selby to pick up some of her brothel’s clientele. But as beautiful as that patio, high ceiling, and lovingly restored interior is, when I’m at Frost, I just don’t feel like I belong there. Maybe I’m a little too much like Fitzgerald, living in flat after flat, moving from town to town, not so sure whether to accept or reject the landed gentry living it up in all those prestigious Summit Avenue homes. Or maybe I just need to spend more time at the bar rather than the dining room. “Of course I do. We’re the hippest people here,” he said, not missing a beat. And so it goes. To date well is to be a curator of moments, collecting those that stand out and tell a story about an individual. I liked this particular moment. It said he understood. I ordered pan-roasted Norwegian salmon with goat cheese risotto, bloody mary consomme, and petite herb salad. Everything about this entree came together nicely, especially the moat of consomme around the meal. PS ordered braised Fischer Farms pork belly with sauteed brussels sprouts petals, Vine Valley Farms butternut squash and miso broth, bacon-braised grits, and pickled pear. He also spoke highly of the bright rim of orange squashy stuff that surrounded his meal. The thing I like about Frost’s traditional plating is the always unexpected line-up of ingredients that accompany it. Bloody mary consomme? Pickled pear with a squash miso broth? Having a meal at Frost is a little like finding a wild outfit in your grandmother’s stately closet. The entrees, though, were mere appetizers to the extraordinary dessert that followed. We shared a Meyer lemon cheesecake with gingersnap crumb crust, toasted pine nuts, Ames Farm honey, and candied Meyer lemon zest. Woo boy. I’m a lover of all things savory, and this dessert was almost like a third entree that was satisfying on so many levels. “Make sure you get a pine nut,” PS said. No problem. I think I’ll be returning to Frost to sit on the patio in the summer or to meet the bartender, who seems to have a good reputation. I’ll be using it as a wine bar that has a most impressive list from around the world. I’ll be sitting by the big bar windows to watch the snow fall in such a lovely part of town. It’s a perfect winter spot, which also reminds me why I like the snow. It’s fun to say goodbye in. PS and I parted gracefully on the street corner as I donned my hat and walked back home. 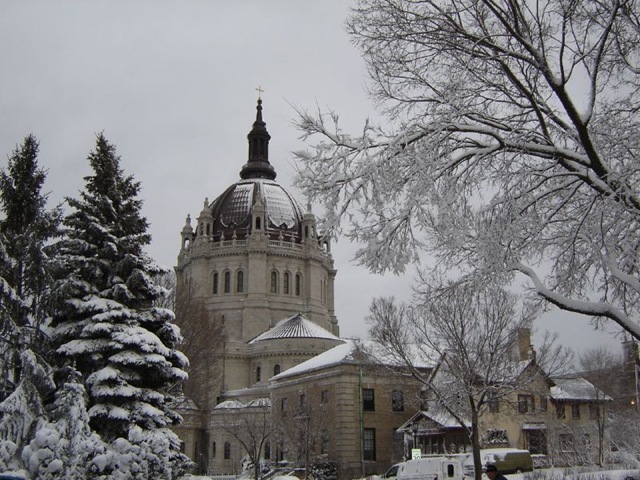 This entry was posted in Around Town, St Paul Restaurant Reviews, Tete a tete (That's French for "dating") on December 9, 2008 by Carrie. In all my years here, I’ve still never been to Frost. I do want to remedy that, though maybe not on a second date. I went to Frost a few years ago for my birthday lunch and my entree was tenderloin with wild musrooms and greens, from what i remember. It was good. I didn’t realize the dinner menu was so edgy. Yes, Stef. Get your self over there. Next time you need a date spot, you could consider the bar at Frost. I didn’t even mention the huge cheese selection to go with the wine. Ang – Curiously enough, they even have a tofu meal.